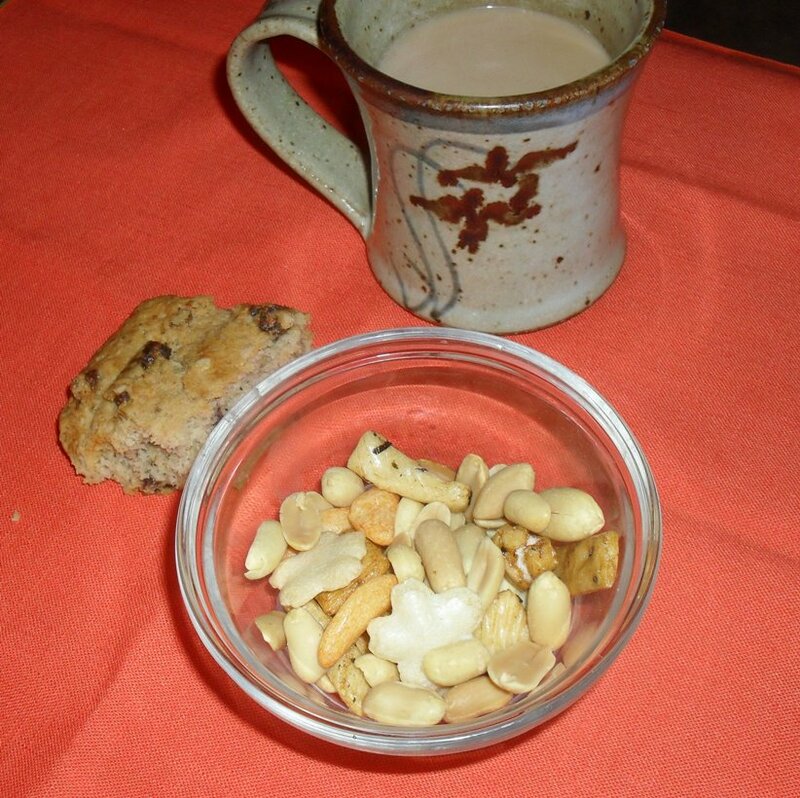 Full disclosure – in about 3 hours there will be 1/2 of a white chocolate/macadamia nut MOJO bar. Just coz I like to break it up like that! Have a great weekend everyone. And try to learn at least two useful bits of info before Monday morning! Yesterday, after being awake for about an hour, my tummy began with it’s favorite mantra, “Feed me! Feed me! But not too much. 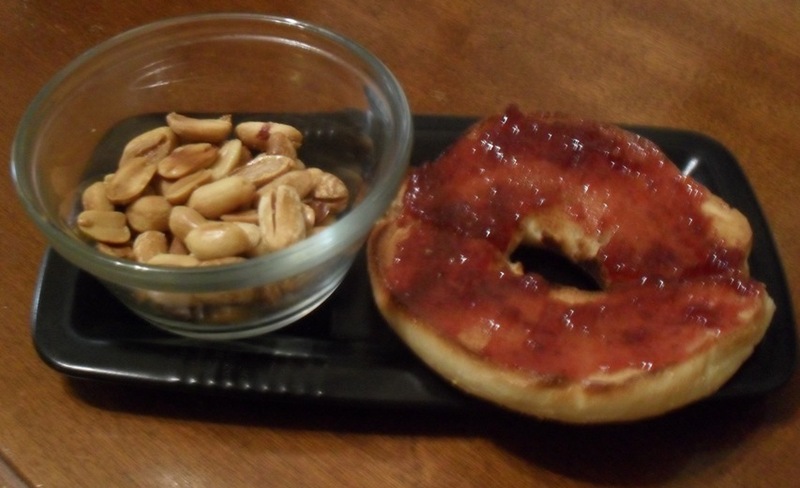 Yet.” So I pinched off a piece of vegan date scone from Wholefoods and prepared my own little fusion of roasted unsalted peanuts and those tiny Oriental rice crackers. The crunch of these teeny crackers I hold to the highest esteem! I love crunchy food. I spent most of the morning reading and writing and watched part of a most wonderful DVD, Forks Over Knives, a documentary touting the health benefits of a plant-based diet. Not preachy. The science of a plant-based diet and how it affects our bodies is the focus – but told in a way that laypersons can very much understand the research and results. And we learn about a few people and their personal stories and see their health improve as they change the way they eat. I highly, highly recommend it. AND !! If you subscribe to Netflix, it is available there in DVD and streaming video. Soon it was time for lunch!! 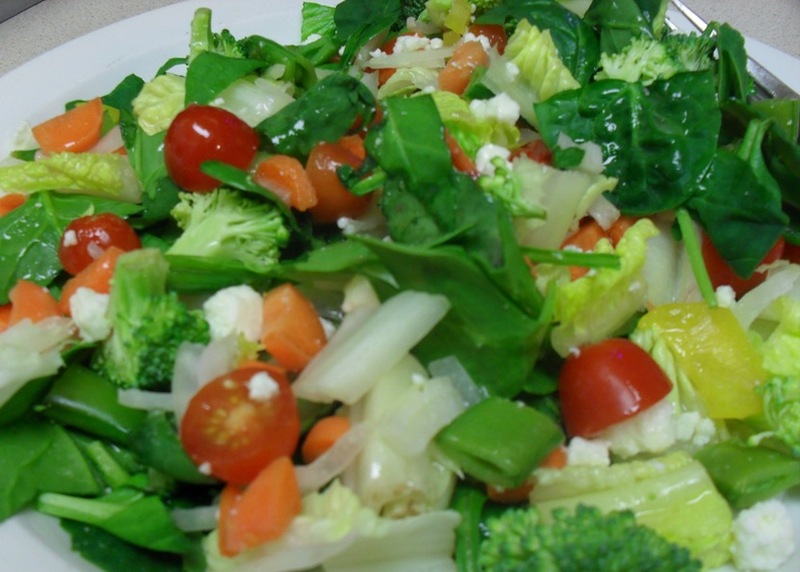 I prepared a delicious and very pretty salad of fresh veggies (including a few sugar snap peas I purchased from the Whole Foods salad bar last week) with feta cheese, topped with a little olive oil/lemon juice, garlic dressing, also purchased at Whole Foods. Oh yum! I ate every bit of veggie morsel available! About an two hours after lunch I prepared a snack of half a molasses/ginger cookie from Whole Foods and a cup of tea. 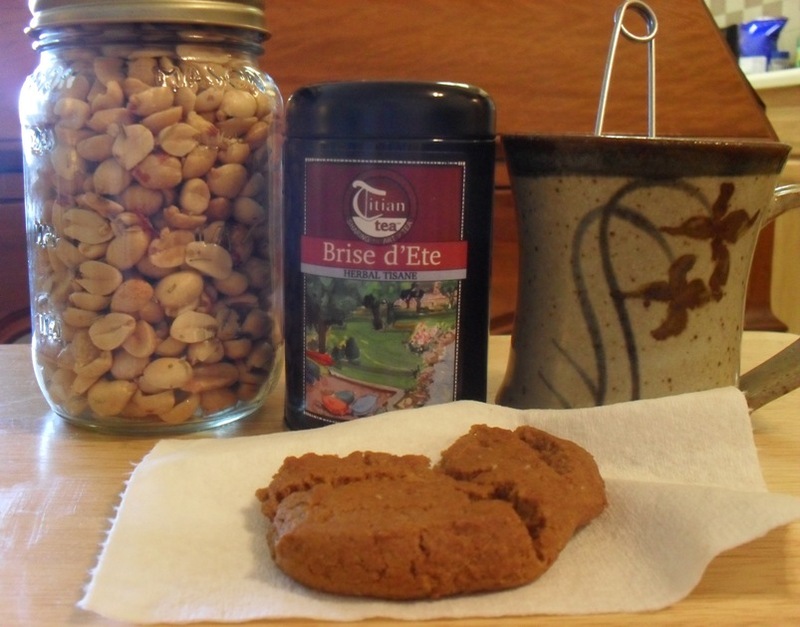 The tea of the day was Brise d’Ete, purchased from Titian Tea. Titian Tea is a company owned by a friend in Manhattan, KS and I highly recommend her tea. The little tins are just the perfect size for someone like me who doesn’t drink tea every day. Also in the picture below is a jar of rosemary and garlic peanuts I roasted earlier in the day. They are delicious – and had to place them in a photo someplace! I tried them last summer in NYC at The John Dory Oyster Bar and thought the were absolutely scrumptious! Next time I will add a little more rosemary, but these in the jar will do just fine until then. 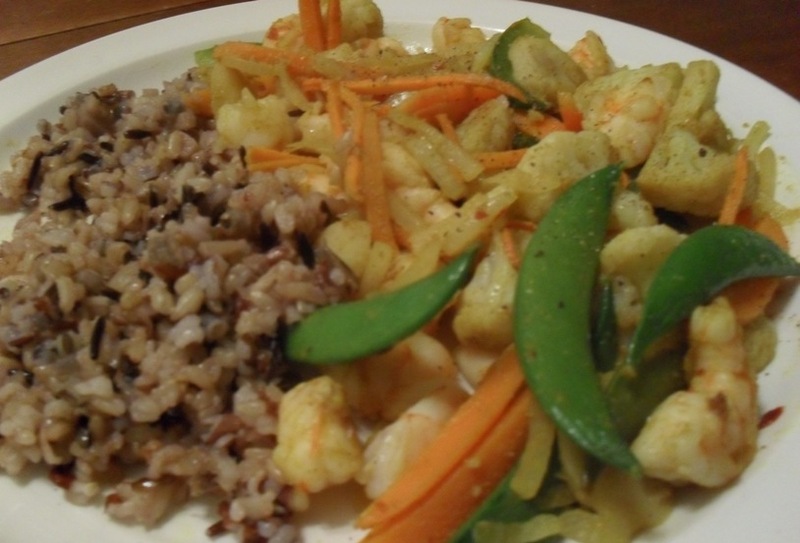 After the tea and cookie I was able to complete the writing (except for polishing), finish Forks Over Knives, talk with a girlfriend from my young-mom days, and prepare my fantabulous supper dish of Vietnamese curried shrimp and cauliflower. I also added a few more veggies such as onions and carrots and sugar snap peas (Again. Did someone say sugar?). Also included a side of wild rice. Oh my oh my! Full confession time. I finished the day with some peach pie I bought frozen at the grocery store. What can I say? It, too, was delicious!